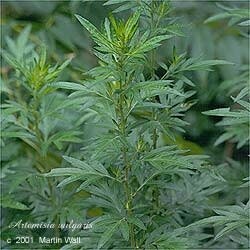 The genus name, Artemisia, is thought to have been given in honor of Artemis, the Greek goddess of the hunt and moon and patron to women, especially in matters of menstruation, pregnancy, labor, and menopause. The common name mugwort references this plant's use as a flavoring agent for alcoholic beverages (consumed in mugs), especially beer, before the use of hops. Mugwort is an aromatic perennial that is native to Asia but cultivated worldwide. It can grow from 2 to 5 feet in height. The stems are grooved and hairy. The leaves are alternate, pinnate, and serrated, silvery above and tomentose below, with five to seven lobes. The flowers grow as numerous greenish yellow spikes. The plant's aroma is often described as 20 being a cross between that of camphor and sage. In the garden mugwort requires well-drained soil, full sun to partial shade, and only moderate water; it will tolerate drought. Mugwort warms the body, arrests bleeding, and clears toxins and parasites. Small amounts can be used to strengthen digestion and the nerves. The leaves have been found to have activity against strep and E. coli bacteria and also against dysentery and typhoid. Mugwort is used in the treatment of amenorrhea, anorexia, appetite loss, arthritis, asthma, bladder stones, bronchitis, colds, cystitis, diarrhea, dysentery, dyspepsia, epilepsy, fever, flu, gallstones, gout, headache, hemorrhage, hepatitis, hysteria, irregular menstruation, jaundice, kidney stones, malaria, menopause symptoms, menorrhagia, menstrual cramps, palsy, parasites (pinworms, roundworm, scabies), rheumatism, sore throat, stomachache, and tonsillitis. It also can be used to stimulate labor and the expulsion of the placenta. Topically, mugwort can be used as an abdominal compress to speed labor. A mugwort compress can also be used to treat boils, itching, rashes, and scabies, and a compress, poultice, or liniment can be used to treat arthritic joints, bruises, headache, insect bites, and swellings. In a gargle, mugwort relieves sore throat; in a hair rinse, it prevents hair loss, and in a footbath it warms and soothes tired feet. The crushed herb can be used as a poultice to get rid of warts. The dried, powdered leaves are used as a snuff to relieve sinus congestion. Mugwort can also be smoked to relieve asthma symptoms or simmered for decongesting vapor inhalation. It also is used to perform moxabustion, the process of burning herbs either close to or on acupuncture points or acupuncture needles to further stimulate the points. Although very bitter, mugwort is edible. In Europe it has been used to flavor dishes such as dumplings, salads, soups, and meats. It also is sometimes used to flavor beer, liqueurs, vermouth, and vinegars. Eating a bit of mugwort with a meal helps counteract the digestive distress that eating fatty foods can cause. Legend says that Saint John the Baptist wore a girdle of mugwort when he took to the wilderness. Mugwort is also sometimes used for "smudging," or burning the herb to purify an area. A sachet filled with dried mugwort and placed in one's pillowcase inspires vivid dreams. Mugwort repels moths, cockroaches, and rodents (but if overused as an insecticide on plants can inhibit plant growth). It is sometimes smoked as a tobacco substitute. When dried, it makes excellent tinder for starting a fire. Avoid ingesting large amounts or using for extended periods, as either may adversely affect the nervous system. Avoid during pregnancy (but note that mugwort can be used to speed labor, under the guidance of a qualified health-care practitioner). Also avoid while nursing. Contact with the plant may cause contact dermatitis in some people.